I'm a hustler. Not the kind who'll pretend to be terrible at billiards and then run the table and take your money 20 minutes later. I'm too fragile-framed for that gig. Rather, I keep things moving in my life to make as much dough as possible by working smarter. That means monetizing many of the material possessions I have, like micro-subletting my homes on vacation sites, using my car to drive for Uber and Lyft, and renting out my bikes and kayaks, among other lucrative opportunities. I don't have a drone (yet), but if I did — well, this is how I'd make that little spy copter pay for itself over and over again. Contractors are always seeking ways to get ahead of the competition and put their names in front of more potential clients. Nathan Outlaw, CEO of engineering and construction firm Onvico, says he works with plenty of contractors who use drones to capture the progress of their ongoing projects, as well as the finished products. "New construction is a great opportunity to make money with a drone," he says. "Get the names of the customer's construction coordinator and the contractor's project manager and call or send an email off explaining your services and how you can assist them in showcasing the project." Outlaw suggests emphasizing how drone photographs can be used to reassure their existing clients and advertise for new ones. I invest in real estate, so I get to see some of the innovative marketing tactics realtors are using to attract potential buyers on a regular basis. By far, the most impressive is a virtual tour of the home captured by drone. It's usually available right on the digital listing. It opens right up, and you can give yourself a "tour" of the home without ever leaving your chair. This is especially helpful for folks who can't necessarily attend an open house, like those searching for a home in another state. You can find the names and contact info of plenty of realtors in your area to whom you can pitch your services just by riding around town looking for "For Sale" signs. Tourism boards are always trying to attract new and repeat visitors, and the best way to do that is to show them what they're missing out on. There's no better way to do that than with a drone. These tourism orgs also usually have healthy advertising budgets, so don't be shy or sell yourself short to get in the door. Kids these days are hiring drones to capture fun memories from their weddings and parties from angles that are quite impressive when you're reliving the experience at home. Plus, drones are an instant icebreaker for mingling guests who don't know each other. You can find out who's getting hitched by browsing the engagement announcements in the local paper. Large expanses of land, especially those loaded with amenities and sporting opportunities, are perfect candidates for drone video. Identify these properties in your area — golf courses, beach clubs, and hunting reserves — and reach out to the manager or the marketing team if there is one. "Talk to hunting reserves and plantations about showcasing their land and showing off acres of dense trees, birds caught taking flight, and deer running across a field," Outlaw suggests. "Show them how your product can attract people to their woods." It's best to do this kind of work during the offseason when employees have more time to coordinate your services and are actively thinking of ways to market their properties. Local bands without big budgets are often on the lookout for someone who can help them make music videos. Drones provide excellent opportunities to get into this type of work. Same goes for low-budget productions of TV shows, movies, and other video-based entertainment. A lot of times these productions already have crews assembled, but you won't know until you introduce yourself and present a portfolio of your drone-flying skills and the videos you've made. The earning potential will vary depending on where you live and how frequently productions film in that area, but you could see a substantial payday if you play your cards right near major cities. If there's anything wrong with a homeowner's roof, chances are they need to break out the long ladder and climb on up there. Not only does that present a certain amount of danger, but a lot of people are uncomfortable with heights. Marcion Albert, chief editor of NewAwning.com, says drones can solve the problem by taking video showing the condition of the roof. "All sides of the roof are easily accessible with the drone, which isn't the case for a traditional inspection," he says. What's more, drone photography can protect tile roofs that can get damaged when someone walks on them. "The drone videographer also has the ability to zoom in on each shingle or tile. This is fantastic for documenting any damages to an insurance company, or if you are selling an older home to demonstrate there are no issues with the roof." The number of homes with solar panels is rapidly increasing, and many vendors offer warranties if a panel is defective. 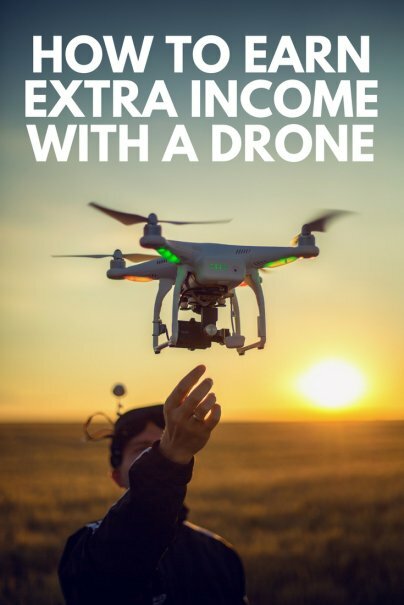 There are rules for just about everything, including earning money with drones. According to Geoff Gelay, owner of RCHeliCam and a pioneer in the drone industry, in order to become a legal commercial operator, you'll need to register your drone with the Federal Aviation Administration and pass an FAA Part 107 test. "The FAA Part 107 is a test that covers basic aviation, some general aviation rules (full-scale aircraft) and some UAS (Unmanned Aerial System) specific material," explains Gelay. "It is also a very good idea to have at least liability insurance covering yourself/your company in the case of an accident." Obey the law, and make that money!